On this page, you will learn how you can treat your golfer’s elbow. A Golfer’s elbow can be caused by overworked as well as tense arm muscles, which subsequently lead to an inflammation of the corresponding ligament attachment sites. It’s not uncommon for trigger points in remote muscles to exacerbate this pain by irritating your nervous system. It is important for you to know which muscles are involved and how to relieve tension and eliminate trigger points in the affected muscles. I will explain all of this to you in the next section. This way you can access all the info whenever you have time, without having to have an internet connection running. Tension and trigger points can easily be treated and eliminated with self-massages. Trigger points don’t disappear by themselves, but they can be “massaged out” of a muscle very easily. Muscle tension: By properly applying pressure on a muscle, you call on your nervous system to relax the muscle in question. Your nervous system is the body’s control station and as such also controls the tension in your muscles. In the following, I describe how to massage four specific regions of the body and the associated muscles, which, due to stress, can be the cause of golfer’s elbow. Important: You should always focus your massage on the tense and painful regions in a muscle. That means that you should take the time you need and follow the instructions provided below. By doing so, you will be able to figure out which muscles or areas of the body are concerned. Once that is done, massage the respective muscles daily until the pain is eliminated. It’s as easy as that! All you need is patience. Let’s begin by massaging the inside of the lower arm. Here you will find your wrist flexors, all of which originate at the medial epicondyle of the upper arm. This is an area which is very painful and sensitive to pressure for those who suffer from golfer’s elbow. You can massage these muscles with a massage ball, or you can use your lower arm. Both are possible, although the massage can be intensified a bit more with the ball. You should look for and massage the painful areas you find in the region of the upper half of the inside of your lower arm. Regardless of the method you choose, it is very important that you experiment with the massage position—and perhaps quite a bit. As little as a centimetre further to the right, left, above or below can often make all the difference. Patience is a virtue that will pay off! Place the ball on your forearm, "kneel down" and lean against a wall. With small, vertical—and above all—slow rolling motions, massage the painful areas in your lower arm. Experiment by trying different position for the ball on your arm—a bit more to the inside, toward the centre, the exterior of the lower arm, and so on. Lay the arm to be massaged relaxedly on your leg. With the outer edge of your elbow, press into your lower arm and repeatedly close and open your fist. 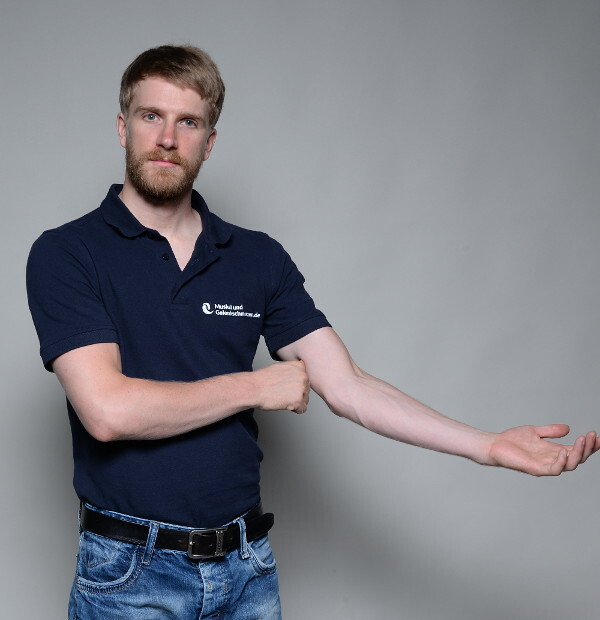 Again, you should try out lots of different position for your lower arm. Let’s take a look at the triceps brachii of the upper arm. This muscle is very often involved in golfer’s elbow, which is why it should definitely be examined thoroughly. There is one precise region in your triceps that can contribute to the pain of golfer’s elbow. This location is found on the inside of the muscle, a couple of centimetres above your medial epicondyle, i.e. the interior elbow bone. Search in this area—give or take a couple of centimetres—for tension by pressing into the muscle with your thumbs. As soon as you find a tense or painful spot, massage it no more than15 times using the thumb technique. Only massage the area immediately before and after the spot. Once you have done that, return to the starting position and repeat the motion. The next 5 steps will help you find the spot. Another option is to use the massage ball, which provides an excellent triceps massage. 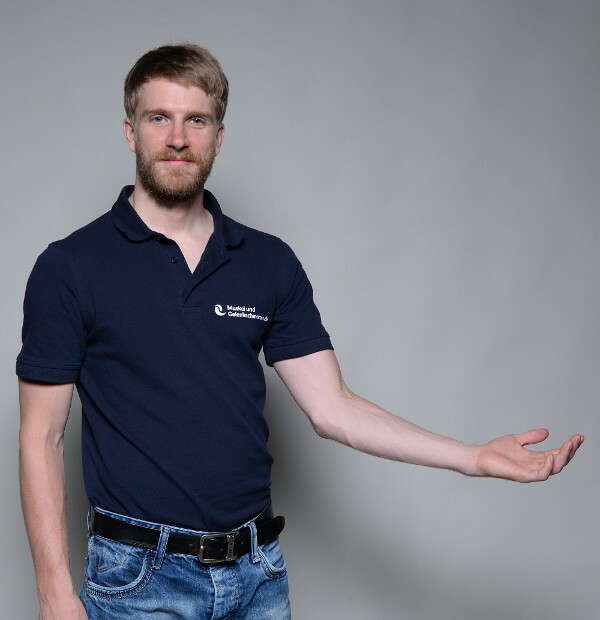 Place your arm in such a way that the tip of the elbow is pointing toward your abdomen. 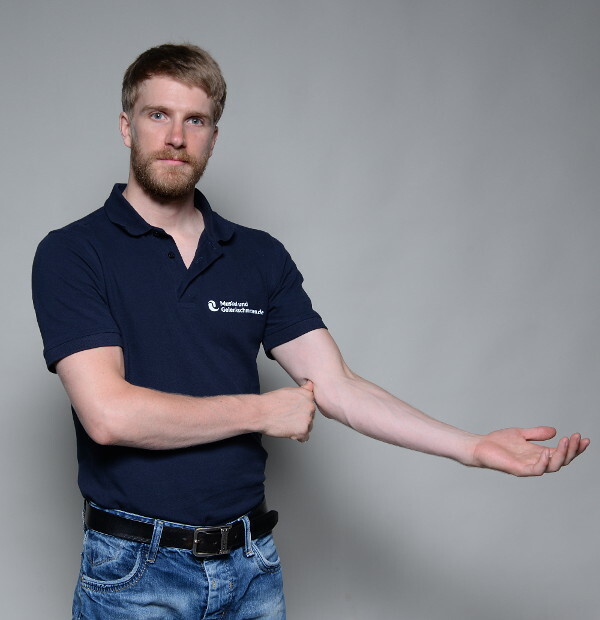 Wrap your hand around your elbow and place your thumb on its insertion tendon – you can feel this very easily, directly over your elbow when you repeatedly flex and relax your upper arm. From this position, move your thumb somewhat toward the inside. Now you are on the muscle itself. Contract the muscle to feel it under your thumb and keep tensing it. From this position, move your thumb upwards 4 – 5 centimetres. Now you can relax again. Now shift your thumb approximately 2 centimetres upward and inward. You are now in the area that likely causes pain whenever there is tension. Golfer’s elbow is most often caused by repetitive, light as well as excessive stress on the forearm muscles. You should primarily be examining the central area of your breast. Here you will find the “central” fibres of the pectoralis major which, due to the presence of trigger points, can often cause pain on the inside of the elbow. I recommend using a massage ball for this region. Take one in your hand and place it on your breast. Now lean against a wall and explore the central area by slowly rolling over it with the ball. Stop at every sensitive location and roll very slowly over it ca. 15 times. Proceed with this method until you have examined the whole central area of your breast. As an alternative, you can use your fingers to do the massage. They are perfect for doing a self-massage in this region. Now, let’s have a look at the outer and upper portion of your chest area where the pectoralis minor – which is smaller than the major – is located. A hard massage ball is perfect for massaging this muscle, but the Trigger Fairy can also be used here. Place a ball or the Fairy under your coracoid process. This is the bony hook-like structure projecting from your shoulder blade that you can feel on the front side of your shoulder in the hollow between your Deltoid and Pectoralis major. Starting there, look for areas that are sensitive to pressure in the slightly slanting 5 – 8 centimetre area below it. Afterward, massage every painful spot with a maximum of 15 short massage strokes. You can also use the pressure-motion technique as an alternative. 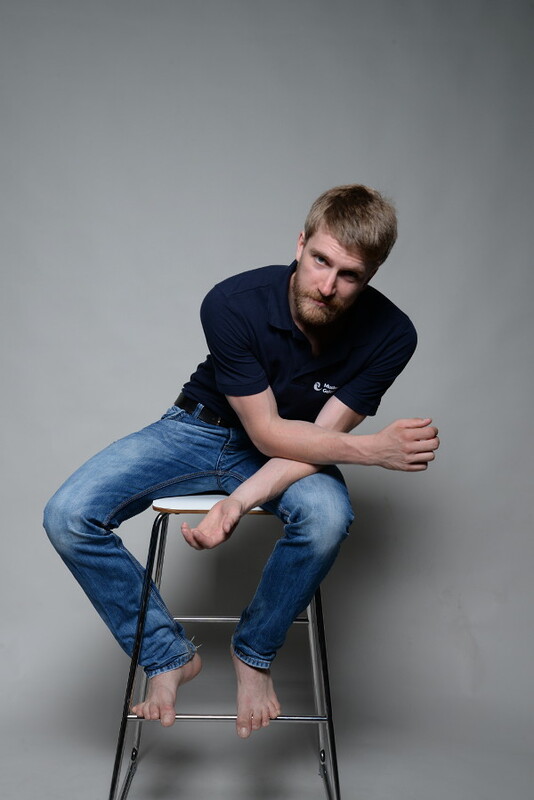 Bend your knees slightly and lean against a wall. Massage the painful areas by carrying out small, up and down motions. Here again you should bend your knees slightly and lean against a wall. Add pressure and lift your elbow up behind you a few times. Hold the Fairy with both hands and press it into the muscle. Pull the Fairy slowly and repeatedly over the painful location, with short, approximately 2 centimetre long strokes. Hold the Fairy with both hands and press into the muscle. Here again, you must lift your elbow up behind you. 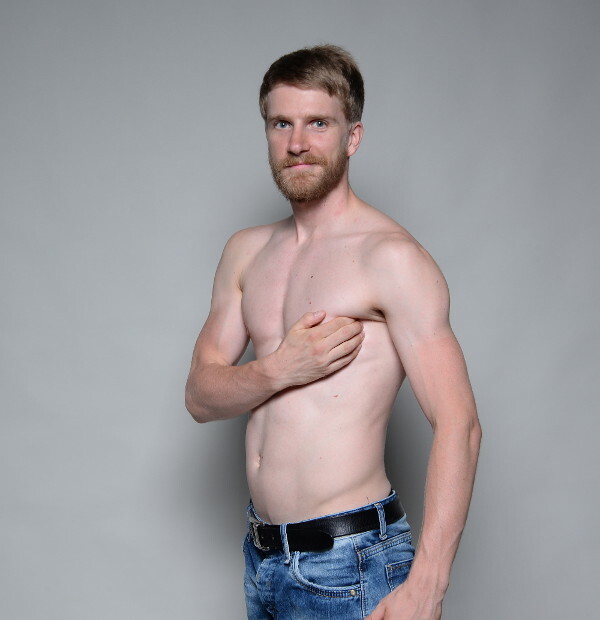 The serratus anterior is a thin, flat muscle found on the side of your ribcage. The best massage for this muscle will be achieved with a massage ball or your fingers. Choose the one you find most comfortable. Search for painful areas on the side of your ribcage using the ball or your fingers and massage these by carrying out no more than of 15 slow massage strokes. Last but not least, we will be focusing on the muscle located under the reverse side of your shoulder blade, namely the Serratus posterior superior. This muscle is best massaged with a massage ball. 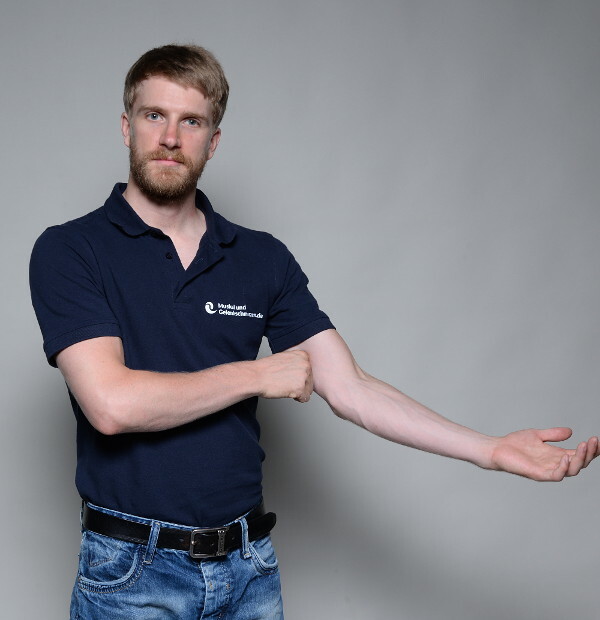 To reach its fibres, you have to cross the arm of the affected elbow in front of your body and hold it there. This is important; otherwise the part of the muscle to be massaged will not be exposed. 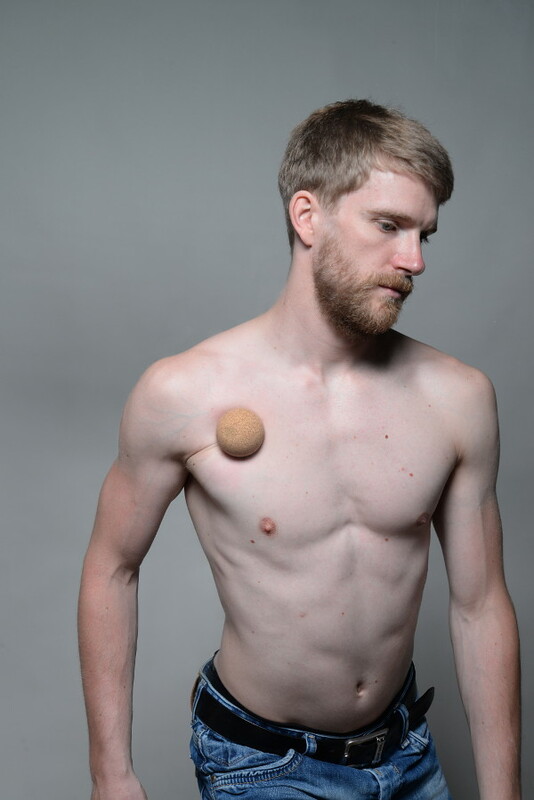 Place a massage ball on the upper, inner edge of your shoulder blade and look in this area for painful tense spots. Massage each painful, tense spot a maximum of 15 times with very slow rolling motions. Make sure to always massage from just before to just after these areas. The effectiveness of your massage depends on your precision. Continue massaging each of the tense areas daily – if not multiple times daily – until your golfer’s elbow disappears! It is important to observe how your body reacts to the self-massage in order for the treatment to be effective. Which massage technique and in which area does the bodywork deliver the best results? Which of the regions presented are not tense and therefore don’t need to be massaged? In which areas are you not sure if you have done everything correctly and should still go over again? Please feel free to contact me concerning any general or even specific questions you might still have.